There are just over two weeks until the final day of the 2015 UN Paris Climate Conference on 12th December and climate campaigners are driving one final, mighty push on politicans to ensure that we get the best possible outcome in Paris. On Saturday 28th November, local climate campaign teams across the West Midlands will be giving people in the region the opportunity to send their own personal message to David Cameron and the UK delegation, demanding a clean and just future for our planet. 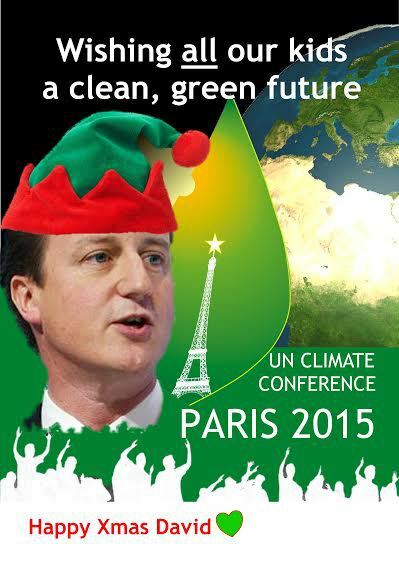 The Christmas card will remind David Cameron of his pledge to limit warming to 2 degrees and ask him to make his own pledge in Paris for real action that will build a green and fossil free future. With lots of signatures and personal messages, the Christmas Card for David Cameron will send a really strong and powerful message to the Prime Minister from the West Midlands. Climate Action Network Birmingham are looking for as many volunteers as possible to join their local campaign team to ensure that voices in our region are heard. If you would like to take part, let Climate Action Network Birmingham know by contacting CANWestM@gmail.com. This is a fantastic final opportunity before COP21 to show David Cameron that the West Midlands demands climate justice and won’t settle for anything less than a clean future!